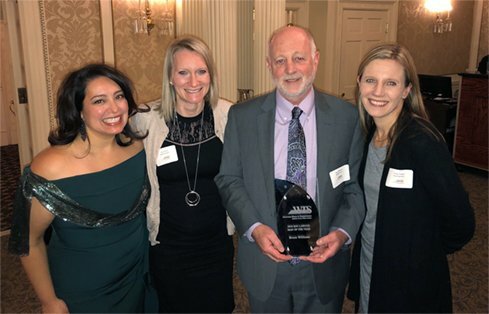 The Spokane-Coeur d’Alene chapter of WTS (Women in Transportation Seminar) recognized GeoEngineers Principal Bruce Williams with its 2018 Ray LaHood (Man of the Year) Award on Thursday evening. Named after former U.S. Transportation Secretary Ray LaHood, the award honors male allies who champion women in transportation. WTS is an international professional organization of women and men dedicated to advancing and supporting women in the transportation industry. The Ray LaHood Award is given to a man who has been key to WTS’ efforts to attract and advance women in transportation—a cause Bruce has championed for decades. During his 33-year career, Williams has provided support and leadership to the Spokane-Coeur d’Alene WTS, and encourages others in the community to do the same. His colleagues estimate that Williams has mentored more than 50 women during his career! He takes every opportunity to advocate for women in the transportation industry, and cheers his friends and mentees on as they’ve been promoted into key positions at GeoEngineers and in other firms. Left to Right: Client rep Lisa Corcoran (senior project manager for Spokane Airports), April Smith, Bruce Williams and Teresa Dugger.